Yup, once again Nicholas Cox has taken a position agreeing with an earlier Barbados Free Press article. It is always heartening to see that members of the local news media and frequently published writers still come around BFP once in a while even though we constantly criticize the Bajan news media on many levels. This time Nicholas expanded upon our little article Illegal Dumping Free-For-All In Barbados: No Charges, No Penalty if you are caught! In his Barbados Advocate piece Time to make dumpers pay! Nicholas makes some fine points about the big-time dumping and small-time littering that threatens our tourism industry and has become an all too frequent occurrence in Barbados. The problem is so deep-rooted that Bajans, argues Nicholas, need a cultural change. He shares our belief that consistent enforcement backed by consistent penalties in the form of fines is foundational to changing our bad habits. An article well worth your time at the Barbados Advocate: Time to make dumpers pay! 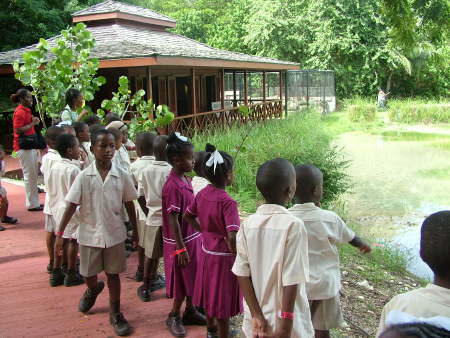 On Saturday, August 15, 2009, a group of about 15 fisherman were found in the Graeme Hall Nature Sanctuary fishing illegally for its rare tarpon, the largest and most popular exhibit fish in the Graeme Hall wetland. Five of the “ringleader” fishermen were caught and questioned by police and Sanctuary security personnel as the other ten fled. Another incident like this happened in late March of this year. In both instances police were called, but there was no immediate response, and insistent follow up requests by Sanctuary staff had to be made before they came. As of Friday, August 21, police had not made any arrests or brought charges in either case, and in fact had allowed the fishermen to leave the Sanctuary with all of the dead tarpon. According to Peter Allard, owner of the Sanctuary, the value and integrity of the Sanctuary investment depend on enforced protections of wildlife inventory. 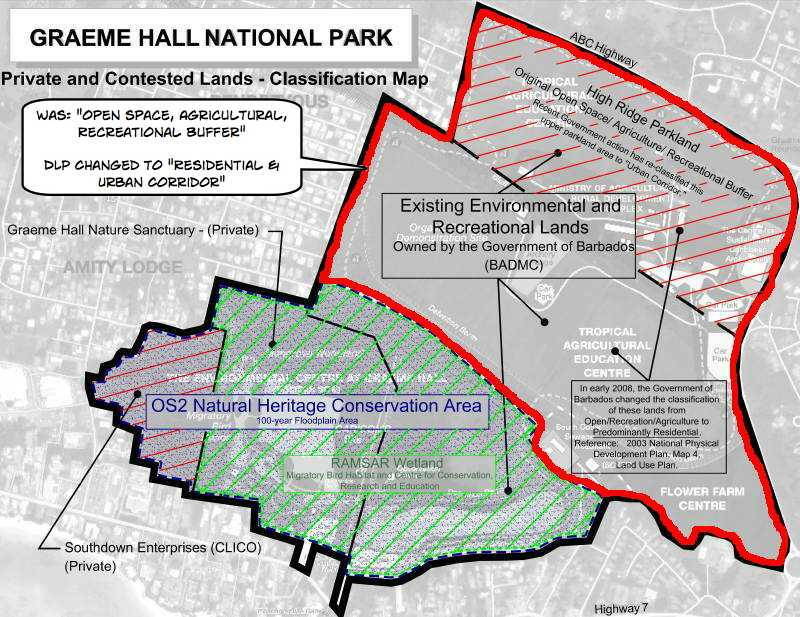 The long term health of the Sanctuary also depends on the enforcement of Barbados’ pollution and other environmental laws within the Graeme Hall wetland and contiguous lands. 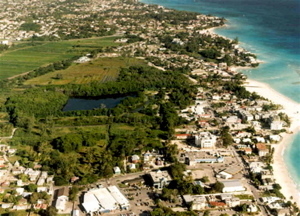 To protect his investment, Mr. Allard is making a formal request to the Government of Barbados that immediate criminal trespass, theft, and related environmental poaching charges be brought against all future violators and the ringleaders of the last trespass be immediately notified of this proposed action. Allard noted that it is also an issue of protecting the last remaining biological reserves of Barbados. This wildlife is part of Barbados’ natural heritage within the OS2 Natural Heritage Conservation Area, and is part of the international Convention on Wetlands Multilateral Environmental Agreement (RAMSAR) to which Barbados is a party. The Sanctuary is also calling upon the Ministry of Environment and all conservation groups to increase their efforts to educate the mainstream public about the seriousness of wildlife and habitat protection in Barbados. The Graeme Hall Nature Sanctuary occupies 35 acres of the 81 acre RAMSAR wetland at Graeme Hall. The RAMSAR designation is associated with the 1971 RAMSAR Convention on Wetlands Treaty for internationally significant areas of biodiversity. More information about the Sanctuary can be found at www.graemehall.com. After some scratching of heads we were unable to come up with one real action that happened. Sure, lots of talk, lots of speeches and promises, but as to a real and positive action – nada. Now it might be that we at BFP missed something. Perhaps there was some real and substantial environmental action taken by the two environment ministers we’ve seen in the Thompson government so far. But we’ve been asking DLP supporters for months to please let us know of one real and substantial positive environmental action taken by the DLP government and so far no one has taken the time to write a comment with that information. We know that the government and DLP supporters read this blog, so we have to assume that the answer to our question is evident. Nada. Nothing real and positive has been done with the Environment Ministry and the environment in an entire year. The Only Action Taken By The DLP Government Has Been To Make It Legal To Build On The Graeme Hall Wetlands! In fact, if we’re talking environment, the only real and substantial action taken by the Thompson government has been NEGATIVE. The DLP government ratified the BLP government’s Amended 2003 Physical Development Plan which establishes an “urban corridor” for the Graeme Hall green area seaward of the ABC Highway. This “urban corridor” parcel is well-known, as it was the scene of the infamous Caribbean Splash Water Park application. This is in sharp contrast to the recommendations of the 1986 National Physical Development Plan and the 1997 ARA Barbados Tourism Development Programme Study. It is also contrary to the National Park proposal which recommends the land be used for low-impact family recreation, walking and bicycle trails and other related uses. 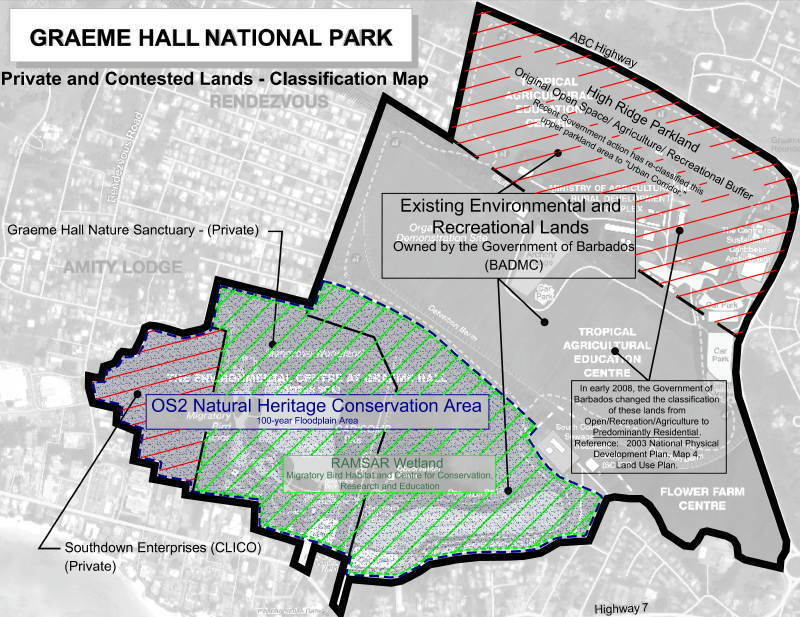 Environmentalists also assume that in the minds of many influential government officials and developers, the RAMSAR site where the Graeme Hall Nature Sanctuary resides exists as a 100-year floodplain sump to be used for contaminated stormwater, instead of as a vibrant and living wetland. Thompson, Lowe & Parris: What’s The Connection? And, bye the way… who do you think owns land in the “urban corridor” of the Graeme Hall wetlands? Why, CLICO, thats who! Yup. Same old, same old ’bout hey. It looks like Thompson and his CLICO mentor/financier Leroy Parris are going to get their wish to develop and profit from what is one of our last remaining natural treasures. Barbados Awards Oil Rights To Company Responsible For Worst Environmental Mining Disaster! Australian mining giant BHP Billiton was the major shareholder in Ok Tedi Mining Ltd (OTML) and the mine operator until early 2002. At this time, the company handed over its majority stake in OTML to the newly formed and ironically named Sustainable Development Project Company. I don’t know whether to laugh or cry at this my friends. Prime Minister David Thompson and the Democratic Labour Party have just awarded the first Barbados offshore oil exploration rights to a company that does hit and run environmental disasters. You know the type of company that goes into a small country and rapes vast areas without a care about destroying the environment? That is BHP Billiton. A company that brings long-term sickness that injures thousands. A company that leaves malformed babies and miscarriages in its wake. Then after they make hundreds of millions, they “sell” the entire operation and leftover mess to some little nothing of a shell company so BHP Billiton can walk away without liability for the disaster. Then they go to another little country like Barbados, pay lots of bribes and start all over again. Oh… and here is the BEST PART…. Prime Minister Thompson: I am ashamed that I once supported you and your government.